Part two of a five-part excerpt taken from To the Brink, the concluding volume of my circumnavigation trilogy, published August of this year. Click here for part one. His finger travelled the forty miles north to Abu Simbel. Major Hassan said nothing. No smile. No laughter. He furrowed his brow, took a deep drag on his cigarette, and went back to scrutinizing my passport. In a corner of the room, one of his henchmen was going through my gear, pulling out the contents of the dry bags and placing them in different piles. Electronics was already the biggest. The major glanced over at the growing mound of gadgetry: laptop, GPS, satellite phone, EPIRB, video camera, cell phone, RBGAN satellite modem, digital still camera, solar panels, memory cards, video cassettes, power adaptors, leads, extra batteries, and two compasses—one handheld, the other from my cockpit. He pointed and rattled off something in Arabic, whereupon the orderly retrieved the laptop-sized satellite terminal I used to send video footage back to the expedition website. I considered trying to pass it off as a battery pack, but the compass embedded in the front cover would give it away. I told him the truth. The major had been tactful and diplomatic at first, introducing himself politely (“Hello, my nem ees Major Hassan”) and asking harmless questions. His demeanor was starting to change. He stared at me through the swirling galaxies of blue silvery smoke, his eyes narrowed to reptilian slits. “I do not be leaf your story,” he said, fingered the whip ominously. “What part of it?” I asked. I shook my head. I was beginning to see where this was going. In its written form, Lewis bore a loose resemblance to the Hebrew name of Levi. Egyptians hated Jews even more than the Sudanese, a long-standing hostility stretching back to pharonic times that had been more recently inflammed by repeated military defeats at the hands of the Israelis since 1948. “No, I don’t work for anybody,” I protested. 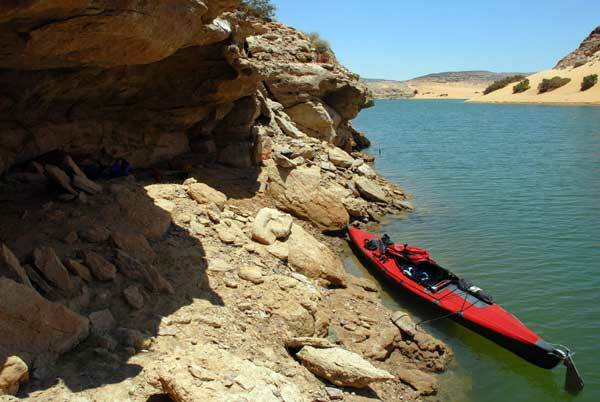 This entry was posted in To the Brink excerpts and tagged Abu Simbel, circumnavigation, human power, kayaking, Lake Nasser by Jason Lewis. Bookmark the permalink.